Since 1986, we’ve been working with interior designers, interior decorators, and others in the industry to create beautiful, custom draperies, Roman shades, valances, cornices, and accessories. Over the years, we’ve refined our drapery workroom process to make it as easy, flexible, and affordable as possible. That frees you up to do what you do best – design! 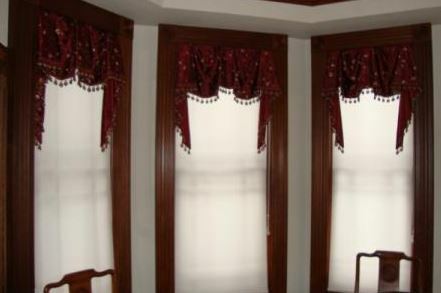 Below are the steps in the process for custom window treatments and other types of custom fabrications. We will need measurements for your project. For window treatments, you can measure the windows yourself, or we can send an experienced professional to get measurements for you. The measurement fee is a $50 fee (or more if high ladder measurements are involved). Once we have measurements, within 1 business day, we can then give you a custom price quote on window treatments, as well as bedding, cushions, pillows, and more. In addition to measurements, we’ll also need to know which type of fabric you’re using, trims, hardware, etc. You can request our drapery workroom price list, which offers our wholesale pricing and will help you quote prices right while you’re meeting with clients. In order to help your clients visualize what a particular window treatment will look like, in place, in their homes, we can create a free custom sketch for you. All you have to do is take a picture of the window (or give us accurate dimensions), tell us the name of the fabric you want, and specify the type of window covering. From there, using a state-of-the-art computer program, we’ll create a rendering that’s incredibly realistic. Ask us to see an example of a free custom sketch. In order to begin a job, we’ll need a completed work order. Our custom work orders are simple to fill out, and include all of the specific details we’ll need to complete your project. We’ll need finished widths and lengths, fabric names and placements, returns, trims, and lining selections. If you need help filling out a work order, we’re happy to walk you through it. We also offer project management services once your order is in place. You’ll need to provide us with the fabric, trim, hardware, and other custom supplies needed for your project. You can bring them to our drapery workroom, or you can order them and have them shipped directly to us. We do offer free pick up and delivery. With most custom projects, we have a 4-week delivery time. The clock starts ticking as soon as we have a 50% deposit for the cost of the job, a completed work order, and your fabric and other supplies. If you have a rush order, check with us, and we’ll see if we can accommodate it. Note that there is an extra 25% charge for most rush jobs. Once your custom window treatments are completed, we can send out one of our experienced installers, for an extra charge. Or, you coordinate installation, and we’ll deliver the finished products to your installer or to your client’s home – your choice. For further information about our drapery workroom process, or to get a custom price quote on your next project, please e-mail contact@draperyworkroomdenver.com. Please note: We don’t work directly with the public. We’re a drapery workroom located in the town of Castle Rock, and we serve clients in the Denver area, Colorado Springs, and throughout Colorado. We work with interior designers, interior decorators, retail stores (who have a designer on staff), builders and developers, and other design industry professionals.